Although holy wells and certain other religious sites generally pre-date the grand medieval abbeys of Wales, like the surviving Castles of Wales, medieval abbeys still dominate the Welsh landscape today. The ruined abbeys of Wales have their own set of unique charms and special histories, tempting visitors to learn more about Britain's medieval monastic past. These structures often overwhelm us with their size and still fire the imagination as we try to picture them in their former glory prior to the Dissolution. But at the same time, they can invoke a sense of sadness as well because of their purposeful destruction that resulted from the political struggles between church and state during the reign of Henry VIII. Any discussion of the abbeys of Wales must, by necessity, lead to the Cistercians. 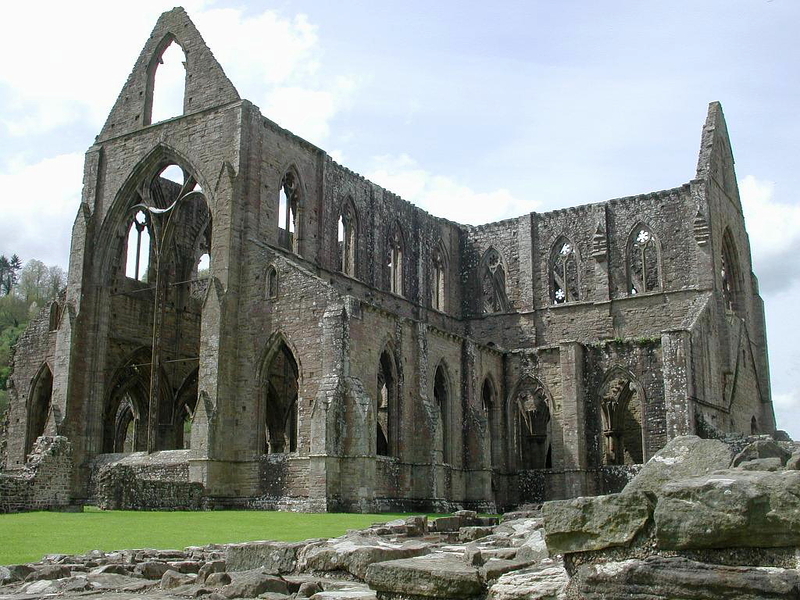 The Cistercian order dominated Wales for nearly four centuries prior to the Dissolution. Immediately following the main menu below, you will find an essay discussing the influence of the Cistercian order in England and Wales, taken from the Cadw guidebooks for Tintern and Strata Florida abbeys. In addition to her marvellous abbeys, Wales is home to other important religious sites as well, including handsome cathedrals and mystical holy wells. We recommend that you take the time to visit some of these marvellous ruins and holy sites, monuments that represent an important part of the medieval heritage of Wales. 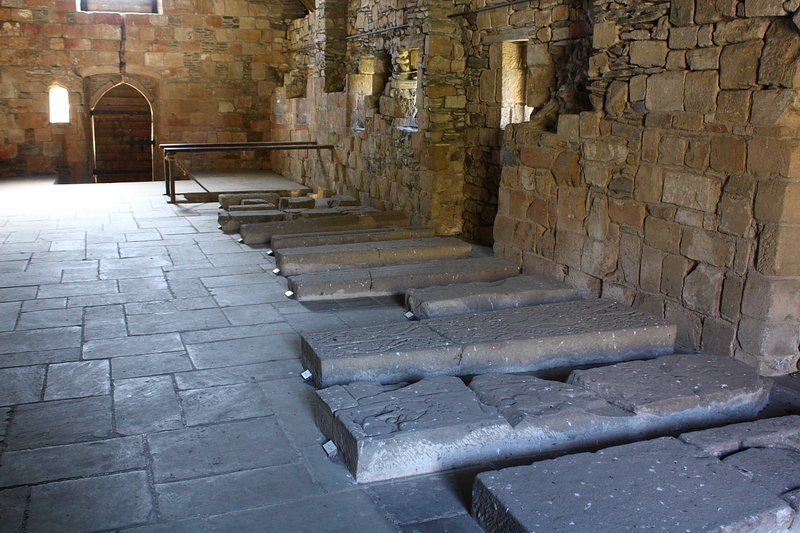 Below: view of the dormitory and its fine selection of sculptured grave slabs at Valle Crucis Abbey in north Wales. 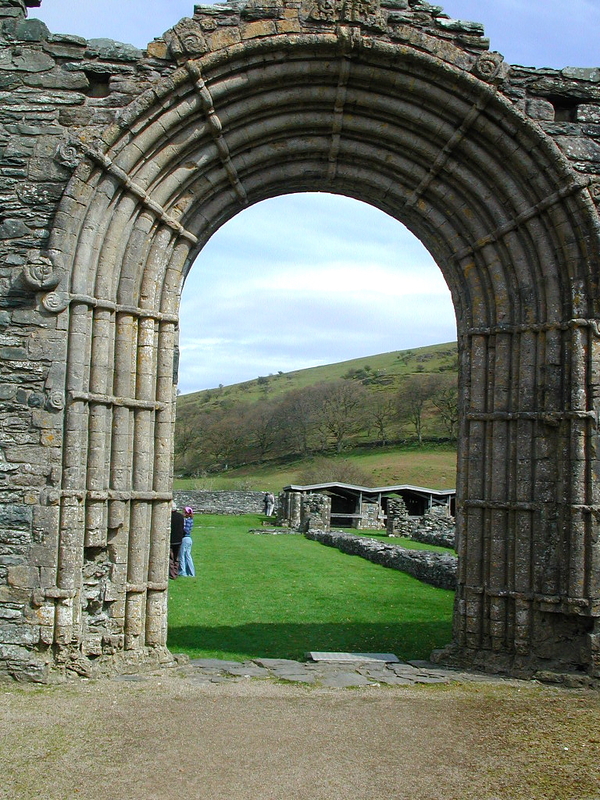 Monasticism in 12th-century Wales was ripe for a change. There were still those who recalled the memory of St David (Dewi Sant) of Wales, who had - according to his biographer - 'imitated the monks of Egypt and lived a life like theirs'. 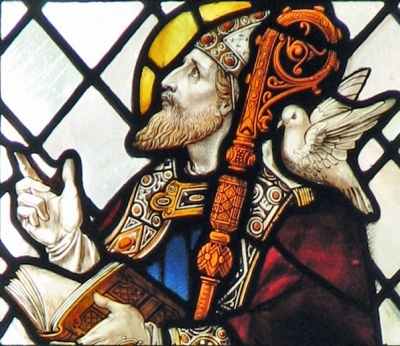 But St David's legendary austerities - his hard manual labour, his vegetarian diet, his constant genuflexions and cold baths - were no longer regularly practised by the self-indulgent hereditary canons of the Welsh clas churches. These ancient mother-churches, once the pioneer instruments of Christian conversion, were well-endowed communities, often headed by monk-bishops. But they had learned to guard the spheres of influence like so many old hens, and they were riddled with every vice of private property. St Benedict formulated his Rule, laying down the way of life for Christian religious community, as far back as A.D. 540 at Monte Cassino in Italy. By the 8th century this Rule had been widely adopted by monasteries throughout western Europe, which can thus be styled Benedictine. In England, these were to receive serious setbacks during the Scandinavian invasions of the 9th century. However, from about 940 the Benedictines saw a great revival, and by the Norman Conquest they were well established in many parts of the country. In contrast, Wales had remained outside mainstream European monastic developments. From the 6th century onwards, it retained its own brand of Celtic monasticism, based on ideals initially introduced to its western shores by early missionary saints. Photograph copyright © 2006 by Jeffrey L. Thomas. Almost inevitably, standards of discipline and devotion varied from one monastic house to another, but by the later 11th century there was growing dissatisfaction with the regime of existing Benedictine abbeys. Gradually, there emerged a reforming spirit, a movement aimed at correcting abuses and introducing fresh ideals to the monastic life. It was from this impulse that the Cistercian order was born. It takes its name from Citeaux, a monastery near Dijon in Burgundy where, in 1098, a group of pioneering monks settled to a new life of simplicity and asceticism. The success of the order owed much to a series of strong constitutional documents initially formalized during the abbacy (1109-34) at Citeaux of an Englishman, St Stephen Harding. Although scholars have shown that the details of the Cistercian constitution were modified over the next two centuries, it was the Carta Caritatis (the Charter of Divine Love), written around 1119, which provided the legislative framework for the order's spiritual ideals. Fearing the corrupting influences of riches on monastic zeal, the Cistercians placed a new emphasis on austerity and rejected all sources of luxury and wealth. Their constitution laid down strict rules for the location of new houses. Cistercian abbeys were to be sited in isolation away from towns or villages, and 'far from the concourse of men'. Their churches were to be plain and devoid of all ornament. They were to wear habits of coarse undyed wool (hence they were known as the 'white monks'). There were strict rules of silence and diet, and their services were stripped of all the liturgical intricacies which had become attached to services at the older Benedictine monasteries. The order was already well established in Western Europe when, in 1128, William Giffard, bishop of Winchester, established the first Cistercian abbey on English soil. The site chosen was Waverly (Surrey) and the house colonized from the Norman abbey of L'Aumone. As in Europe, subsequent expansion was rapid, and by the end of King Stephen's reign (1154) some fifty new foundations had been added to the order. Yorkshire and the north became the cradle-land of Cistercian settlement in England, though Wales also proved attractive to the white monks. In all, some 75 Cistercian monasteries were eventually established in England and Wales. Within the area of the modern Principality itself there were thirteen abbeys during the Middle Ages. The course of their foundation and history, can virtually be seen in two distinct streams. On the one hand, those of the south and east such as Tintern (founded 1131), Margam (founded 1147) and Neath (becoming Cistercian in 1147) were founded by Anglo-Norman lords, and their subsequent fortunes were largely dependent upon later Marcher Lords. In contrast, the other stream lay in the heartland of Wales, with important foundations at Whitland (1140), Strata Florida (1164/84), Aberconwy (1186) and Valle Crucis (1201), all of which were patronized by native Welsh princes. As Anglo-Norman momentum faltered in Wales in the mid-12th century, there emerged a remarkable resurgence in Welsh supremacy in the southwest - the kingdom of Deheubarth. It was Rhys ap Gruffydd (d.1197), prince of this rich and fertile kingdom, who restored native control to the the southwest. Genial and civilized, long-lived and shrewd, Rhys knew the value of monks in his strategy. The Lord Rhys, as he is known, assumed the patronage of both Whitland and Strata Florida. He especially 'loved and cherished Strata Florida'; if not strictly as the founder, he was certainly the effective guarantor of the abbey's fortunes. Within a decade, Strata Florida was to become the scriptoriam where the native Welsh annals were henceforward kept. Under Rhys's generous patronage, the monks eventually laid plans to move to a new site two miles away from the original abbey, where the present ruins now stand. Photograph copyright © 2002 by Jeffrey L. Thomas. More significant than Rhys's concern for this one Cistercian community was his support for the entire body of hermit-monks. Freed from the yoke of its Anglo-Norman identity, Whitland was to become the stem of a new tree. Monks from Whitland colonized Strata Marcella in 1170, and returned to Cwmhir in 1176. Others left Strata Florida for Caerleon (alias Llantarnam) in 1179 and for Aberconwy in 1186. In turn, Cymer was settled from Cwmhir in 1198/99, and Valle Crucis from Strata Marcella in 1201. So it came to be that, in native Wales also, these soldiers of St Bernard 'showed forth the discipline of Clairvaux whence they came, and by works of piety they spread the sweet savour of their mother-abbey, as it were, a strong perfume from their own house. The story spread everywhere that men of outstanding holiness and perfect religion had come from a far land. Many therefore were moved to emulate them by joining this company whose hearts had been touched by God. Thus very soon they grew into a great company...'. During the formative years of the 12th and 13th centuries, life within a Cistercian monastery could almost be seen as falling into two halves. This was, to a large extent, a result of the emphasis placed upon manual labour by the order. They were forbidden the customary 'feudal' sources of revenue such as tithes, manors, mills and rents, and therefore the intensive cultivation of agricultural land was as much an economic necessity, as it was an essential facet of the Cistercian monastic life. However, it was in the further stage of providing a labour supply to undertake this work, that the order proved so revolutionary. Although the choir monks, those in full monastic orders, undertook some manual work, the greater part of the heavy agricultural labour was undertaken by lay brothers, or conversi. Recruited from among unlettered men, the latter made their contribution by their labour. During the early Middle Ages they arrived at abbey gateways in large numbers, and often outnumbered the choir monks by two or three to one. Some lay brothers worked in the immediate vicinity of the abbey. Others travelled to work on outlying estates, usually within a day's journey of the home abbey, where lands had been acquired and organized into characteristic Cistercian farms, known as granges. At the abbey, the lay brothers lived as part of the full community, though they were bound by less severe rules. None the less, this division between choir monks and conversi had powerful influences upon the architectural arrangement of Cistercian monasteries. Even before the close of the 12th century, the drive to increase revenue led Tintern and other Cistercian houses to ignore earlier Cistercian ideals and acquire church tithes. The deposition of Abbot William in 1138, following a visitation from Citeaux, may have been linked to this early breach of constitution. Even so, other churches were appropriated and tithes acquired in following centuries. In 1348 the Black Death swept the country and, although we have no direct evidence for its impact on the Cistercians, the effects are clear. It became almost impossible to attract new recruits for the lay brotherhood. Widespread changes in the economy, with feudal service giving way to a system based on wages, were increased by labor shortages following the plague. At the grange of Merthyrgeryn in 1387-88 most of the area formerly worked by lay brothers had been leased out to tenants. In the 1500s monastic life in England and Wales was brought to an abrupt end by the political actions of King Henry VIII. The Dissolution of the Monasteries was part of the king's policy to establish total control over the church in his realm. But in addition to severing links with Rome, their suppression was a considerable source wealth to the crown. Even so, the brutal demise of some 800 religious houses between 1536 and 1540 was a major step, perhaps made easier by a changing tide of opinion against the monasteries and what they stood for. Certainly, by the time of the Tudor dynasty, much of the freshness and vigour of the monastic way of life had been lost. Tintern Abbey was surrendered to the king's visitors on 3 September 1536. Apart from Abbot Wyche, there were twelve choir monks and some 35 monastic servants. As they left the abbey in late summer, a way of life which had lasted for 400 years finally came to an end. This time-span was almost as long as that from the Dissolution itself to our own period. With the roofs gone, and windows smashed, the shell of the abbey would have fallen into chronic decay.